Learn How a Full Mouth Reconstruction in Waco Can Help Your Smile! 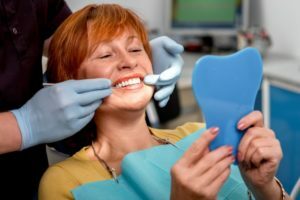 Is your smile falling apart because of years of dental decay? Perhaps you sustained a traumatic injury that left your teeth broken and cracked. Maybe your smile was damaged since birth and you’re finally ready to make a transformation once and for all. With help from your Dr. Cobb and Dr. Lassetter, you can get a full mouth reconstruction in Waco! So, what does this treatment entail? Turns out, it incorporates many different treatments and can vary based on your case. Here’s how your dentist can get you the smile of your dreams. Full mouth reconstructions are treatments specifically designed to restore the aesthetic and functional characteristics of your mouth and smile. Unlike smile makeovers which typically only focus on the cosmetic side of dentistry, full mouth reconstructions make use of multiple dental disciplines to get your smile looking beautiful and healthy again. For missing or damaged teeth, your dentist can use dental implants, full or partial dentures, dental crowns, and porcelain veneers to restore their function and appearance. While some of these treatments require several months to complete, others can be provided in single appointments thanks to advanced dental technology. For example, CEREC crowns are custom-made dental restorations that can be made the same day you visit. If you do opt for dental implants, you’ll be scanned by the practice’s 3D cone beam scanner. This device produces a 360 degree image to help your dentist create a better treatment plan overall, as well as determine your eligibility for treatment. Again, full mouth reconstructions don’t exclusively address the appearance of your smile, but the function as well. People with multiple missing teeth generally can’t eat as many foods or have a very balanced diet. Missing tooth roots cause bone resorption, which leads to a shrinking and weaker jaw bone. It also causes blood flow to cease to the face, making it appear older and sag over time. Dental implants restore all these functions, making you feel like your natural teeth are back again. Additionally, you’d be surprised by how much a smile affects your confidence levels. People with healthy teeth are proud to smile more often, improving their mood and their overall outlook on life. Oral care is also much easier, and you’ll want to practice more once you see the difference yourself. Why wait any longer for your full mouth reconstruction in Waco? Get the smile you’ve been waiting for by scheduling a consultation with your dentist today! Dr. Nick Cobb has many years of experience giving patients full mouth reconstructions. Thanks to his engineering background, he can rebuild even the most damaged smiles from the ground up. To learn more about his practice or see results from patients yourself, visit his website or contact him today! Comments Off on Learn How a Full Mouth Reconstruction in Waco Can Help Your Smile!